Could Uptown be Waterloo’s first protected bike way? Do you bike through Uptown Waterloo? What if you could ride along King Street protected from traffic by a curb and parked cars? In a few years, King Street’s pedestrian-hostile four lane thoroughfare will be a thing of the past between downtown Kitchener and Waterloo Town Square. Implementing ION will mean removing two of those lanes. 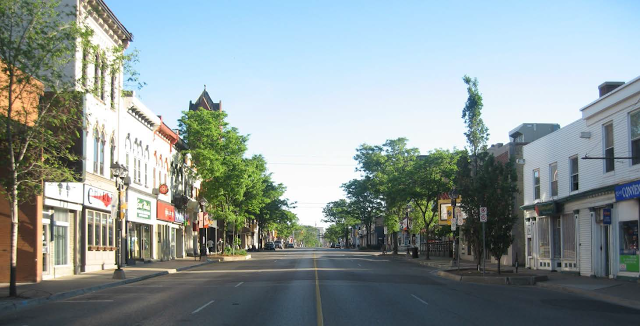 In light of this, the city of Waterloo (in partnership with the region) wants to improve King from Erb St. all the way up to University Avenue. Their plan: trim the redundant road lanes that would dead end in Uptown, and use the room to provide better access for people on foot or bike. The goal: create a friendlier, safer Uptown with space for people to move around, shop, and enjoy the scenery, while smoothing traffic flow along King. As part of this plan, the city proposes to paint traditional bike lanes of sub-standard width in between rows of parking and road lanes heavy with cars and buses. We think they could do a lot better: instead of sandwiching cyclists between open car doors and moving traffic, why not use those parked cars to protect people on bikes? King Street may be the perfect location for Waterloo to implement its very first protected bike lanes. Protected bike lanes are paths for bikes along roads but separated from traffic by a curb, parked cars, or other barriers like planters. With as many as 60% of people interested in cycling but concerned about safety, protected bike lanes are cycling infrastructure for the rest of us. And their popularity has exploded, in places like New York, Toronto, Vancouver, Ottawa, and Montreal. Even Guelph has installed curb-protected bike lanes on part of Stone Road: providing a friendly space for bikes has greatly reduced the amount of people riding their bikes on the sidewalk. Protected bike lanes are effective because they feel much safer for casual riders and their families. How safe are they really? One study took a look at protected bike lanes in Montreal, and found that they substantially reduce injuries while attracting riders from less bike-friendly roads. 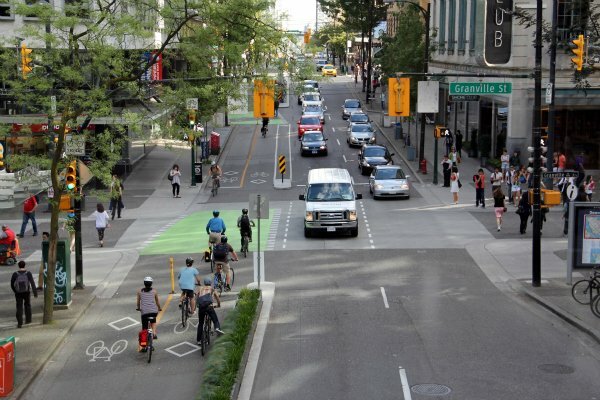 The University of British Columbia has shown that on top of being preferable, protected bike lanes get top marks for safety. But what’s in it for Uptown? Business owners and merchants, who customarily focus on more parking to bring in customers, could stand to reap huge dividends from the presence of friendly bike infrastructure. 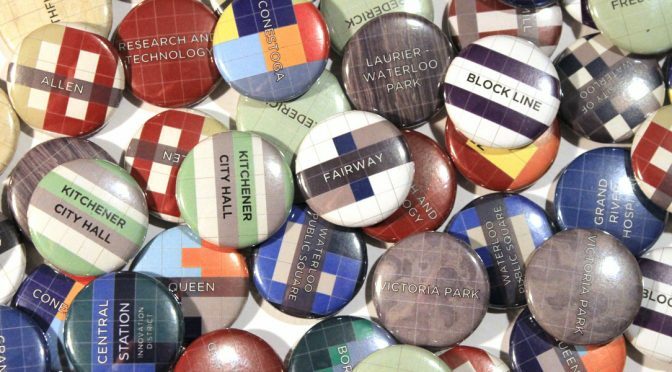 A study of Bloor West in Toronto found that pedestrians and cyclists visit local businesses the most often and spend more money than motorists. New York created the United States’ first protected bike lanes on 9th Avenue and consequently, businesses there saw a 49% increase in retail sales. Closer to home, Waterloo’s ongoing intensification means that number of potential customers within walking and cycling distances of Uptown is growing rapidly. Protected bike lanes are coming eventually: evidence keeps building on the benefit they can provide to our urban environment, and they’re starting to attract Waterloo’s attention. Councillor Melissa Durrell has said that she would like to see protected bike lanes and we agree with her. This is where you come in. A good idea needs support! Visit the public consultation (and submit your feedback), and write your councillors. Tell them Waterloo needs protected bike lanes. To make cycling accessible and safe for everyone, and to keep our Uptown vibrant and healthy, we need to be heard: It’s time for protected bike lanes in Waterloo. Previous PostThe Return Of Douglas CraigNext PostWhy build protected bike lanes? It seems to me that protected bike lanes increase safety in the mid-block areas where there isn’t much of a problem. But most collisions happen at intersections. The various protected bike lane designs either do nothing helpful at intersections, or they make the situation worse. 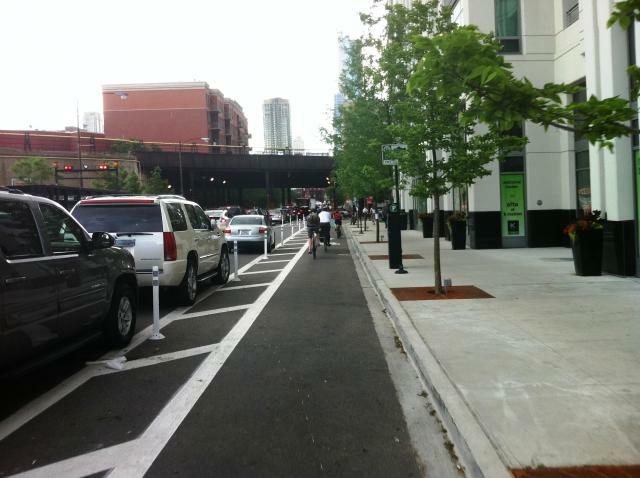 Consider the one-way bike lane “protected” by parked automobiles. The problem with this is that cyclists and motorists can’t see each other properly. That’s okay as long as there are no intersections, driveways or parking lot entrances. But as soon as a motorist is allowed to turn between the parked cars and across the bike lane, he may collide with a cyclist if neither could see the other coming. So this kind of “protection” shouldn’t be used near intersections or where there are private driveways or any other entrance/exit that crosses the bike lane. Your photo of the Dunsmuir Street bike lane in Vancouver shows some of its problems but not all. In the first place, it’s a bad idea to put a two-way bike lane on one side of the street. That causes in increase in the number of crossing paths at intersections, so it makes crossing the intersections more dangerous than on a street with no bike lanes. This problem is somewhat reduced by the fact that Dunsmuir is a one-way street. But there are still more potential collision sources than is the usual case. At some corners right turns are allowed from Dunsmuir that cross the bike lanes. These have a warning sign that nobody will be able to comprehend in the few seconds available. When properly interpreted, the sign says that the motorist turning right is supposed to yield to cyclists coming from either direction (from in front or from behind on his right side, where the blind spot is). He’s also required to check for pedestrians on the other side of the bike lane. It’s possible that Vancouver drivers can manage all that, but I doubt that Waterloo drivers are ready. The only thing a cyclist can do when westbound on the Dunsmuir bike lane approaching a green light is slow down to a speed where a panic stop will work, and keep his hands on the brake levers. A three-phase traffic signal (green for Dunsmuir, then green for the cross street, then green for the bikes) would solve these troubles, but the bikes would likely get a green only about 20% of the time. Intersections without signals would still be a problem. I once found a bike route in Montreal that had all these disadvantages. It had a two-direction bike path and a two-lane two-direction auto path separated by a single lane of parked cars. There were lots of driveways on the bike path side of the street. It only took about 100 m of this before I came to a car parked on the bike lanes right beside another car in the parking lane. After that I rode on the road, where there was almost no traffic. Besides the safety questions, these protected lanes reduce the ease of some normal and legal bike maneuvers. For example, for westbound cyclists on Dunsmuir turning left is more difficult than it used to be. The eastbound cyclists will find that turning right requires that they stop at a green light and then make their turn when the light is red. A big advantage of bikes in the city is the ability to stop anywhere and lock up the bike to whatever pole or railing that’s handy. These protected lanes reduce this ability by about 50% because it is more difficult to get to the other side of the street. Combination bus/bike lane: I’ve tried these in London (UK) and Bordeaux. They work much better than I had thought they would. That’s because buses and bikes tend to travel at similar speeds on average. Typically, a 4-lane city street gets green paint on the curb lanes and some bus/bike diamond signs on the pavement and overhead. That’s all there is to it. It’s cheap, easy to do, doesn’t need any new traffic laws, and still allows the cyclists all their current freedoms. This may be a good solution for King Street, especially the part south of Young Street. Back street bike route: Vancouver has a few dozen of these, and they make a complete network that covers the whole city. You’re almost never more than 5 blocks from one of these routes. Instead of fighting the traffic on Main Street, you can pedal along Ontario Street instead. It’s only 2 blocks away, goes just as far as Main, there’s little traffic there, and you get a traffic light at every major cross street. Motor traffic volume is kept low by blocking the street to autos in a few places while leaving it open for cyclists. In Waterloo, King Street already has some good alternative routes. Regina Street, only a block away from King, has relatively low traffic volumes, extends beyond the extent of this project both to the north and south, and the traffic lights are already there. It also connects to other good bike routes including Park Street and the Iron Horse Trail. Albert Street and the Laurel Trail are other possible alternates to King Street for some trips. I don’t think that protected bike lanes are safer or in any other way better than the traditional bike lanes that the region proposes for King Street. People who won’t ride because they don’t feel safe are irrational. Feeling safe isn’t good for you. It causes inattention, which can be painful or fatal. People who expect to feel safe should not ride a bike or drive a car. It would be money well spent if we could turn these characters into responsible road users, but I don’t think that the protected bike lanes will do that. Evan, thanks for your comment. You bring up some interesting points. But I do want to respond in particular to a few things. On the treatment of intersections: good protected bike lane design will require intersections to be handled well. In particular, sight lines leading to intersections. This may mean trimming back a parking spot here and there, and looking at the angle of turns. Pavement treatment and signalling are other options. Like the protected bike lanes themselves, we need to look at other cities to see how they have been made to work. And we also need to look at other cities’ safety data. We can theorize about what is safe and dangerous but I’ve linked to a couple of studies in the original blog that provide some evidence. And here’s a sobering note: Toronto’s top 2 cycling injury causes in 2010 were sideswipes and car doors. On bus/bike lanes: One of the major factors leading to the Uptown reallocation of space is that there is just not enough space to run 4 road lanes through this corridor. The current lane widths are under spec and the accident statistics bear witness to it. As does GRT’s policy of straddling traffic lanes through the uptown core. Without removing entire lanes of parking, bus/bike lanes are unfeasible. In your last paragraph you make some statements about the irrationality or futility of needing to feel safe while riding. I believe nothing could be further from the truth. Lots of data out there that shows that as the number of cyclists increase, injury rates go down (and vice versa, which makes mandatory helmet laws that reduce rates of cycling particularly insidious.) Building infrastructure to attract new cyclists that feels (and is) safer is the best way to do that. Finally, if you think that people who expect to feel safe shouldn’t ride (or drive), I’m very sorry. I take a different view. There is huge room for improvement in this city for getting around by all modes, and for basic livability and sustainability. Mobility is a right, safety is a right, and I can’t accept a self-defeating pessimism that would deny others the right to pursue improving both.